3. What is the main difference between VAT and GST ? 4. Are VAT and GST the same ? Goods and Service Tax India is a reality today and it has brought the Indian taxation system under its unique ideology ‘one nation, one tax’. The rise of GST has subsumed all the indirect taxes in India, including Value Added Tax (VAT), Service tax, Excise duty, and Octroi. These various forms of indirect taxes and VAT were levied on each step of value addition of the product, thus creating a cascading effect. The game of GST was introduced to bring down unwanted inflation in the economy. Both these taxes are levied on the value of sale or supply of goods. 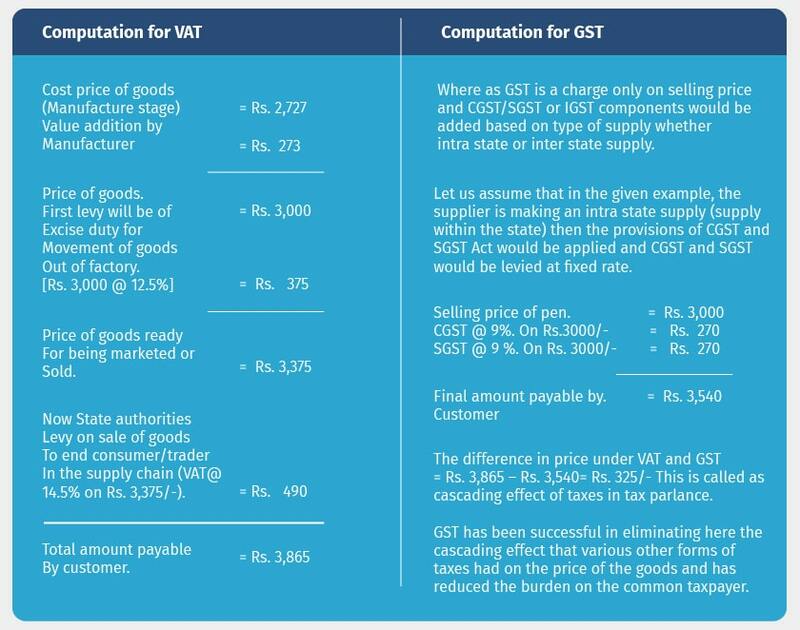 But still, there are lots of differences between VAT and GST India. What is VAT ? Every commodity passes through different stages of production and distribution before finally reaching the consumer. At each stage of the production, a value addition is made in the distribution chain. And Value Added Tax (VAT) is a tax on this value addition at each stage. A dealer under VAT collects tax on his sales, retains the tax paid on his purchase and pays the balance to the government. Value Added Tax is a consumption based tax, because it is borne ultimately by the final consumer. What is GST? Goods and Service Tax which was introduced as a new league in indirect taxation system replaced all most all Indirect Taxes in India. The act which came into effect on 1 st July 2017 is a comprehensive, multi stage, destination based tax that is levied on every value addition. Under GST, the tax is levied at every point of sale. In case of inter-state sales, Integrated GST will be levied and in case of intra state supplies, CGST and SGST will be charged. Taxable Event Is on sale of goods Is on every supply and supply includes goods and services. Different VAT rates in each state. Different VAT laws for each state. For States we have State GST Act (SGST), for center we have Central GST Act (CGST) and for supplies made between the states we have Integrated GST Act (IGST) and for Union territories involved in a supply transaction we have Union Territory GST Act (UGST). Here the state government s have authority over the tax proceeds collected by such levy. Where as Goods and Service Tax is collected under SGST and CGST for every sale from same state. The corresponding center and state amount then gets bifurcated. Taxpayers can claim the credit of tax by netting the VAT liability with input VAT on goods purchased and from output VAT on goods sold. GST is a tax levy on Goods and services as well. A taxpayer can claim the credit on supplies (Goods and Services) received by him to be used or intended to be used in furtherance of business operations. Subsuming of taxes into one pot of GST have made available the usage of credits at one place to be used in the returns. Different set of compliances for movement of goods between states. Preparation of various forms for moving the goods from one state to other. Different returns in different states. So many annexure returns to be prepared. Concept of auto populated return for inward supplies as in GST was absent under VAT law. Because there was no technology and ideology which is present today in GST act present back then. Preparation of one e way bill which is valid across India. Though going by the words of many eminent economists, VAT and GST are just two names for one tax, but on evaluating minutely, one observes the contrast clearly. Let us take an example and arrive at a conclusion whether VAT and GST are really same. Ex : Manufactured cost of a pen = Rs. 2,727/- ; Margin added by manufacturer at time of sale = 10% = Rs. 273 (value addition by manufacturer) ; Excise duty leviable on the product @ 12.5% = Rs. 375/- ; VAT levied by State authority @ 14.5 % on ?